CyberGhost VPN is a Romanian-based VPN provider founded in 2011. Although it is not as popular as NordVPN or ExpressVPN, it is one of the most rapidly growing VPNs in the industry with a strong focus on server selection, value pricing, and reliability. Currently, CyberGhost VPN provides 3800+ server in over 60 countries. To give their users the best experience possible, they are still constantly expanding their server park, and they don’t put any limitation on server switches, so you can change locations as many times as you want to suit your needs. CyberGhost VPN service is compatible with Windows, Mac, iOS, Android, Linux as well as routers, Amazon Fire Stick and Android TV. With just one CyberGhost VPN subscription, you can secure up to 7 devices simultaneously. CyberGhost also has browser extension for Chrome and Firefox that secures your online experience and lets you enjoy the open web for free. CyberGhost VPN provides all the features you need and expect from a VPN service. It utilizes the top-class 256-bit encryption technology to protect your privacy and encrypt all your internet traffic and browsing activities. In addition, multiple VPN protocols including OpenVPN, L2TP-IPsec and PPTP protocols are applied to increase more security for people who need a higher level of security. CyberGhost VPN not only encrypts your connection and protects you from being eavesdropped on by your ISP, the government or hackers, it also comes with the ability to block unnecessary ads and malicious content for you. Therefore, you can enjoy a smooth browsing experience. With an increasing majority of users relying on the Internet for entertainment, news, shopping and also for their careers, getting a VPN will add a layer of obfuscation to your online activities and dig an encrypted tunnel between your traffic and anyone who tries to spy on you. Thus, you can surf the web anonymously and protect your Internet/Wi-Fi connection. CyberGhost VPN also helps unblock streaming and social media websites, defeat censorship and it lets you get the content you want wherever you want it. With CyberGhost VPN, you get unlimited bandwidth and are able to download torrent files anonymously. CyberGhost secures your network and opens up a whole new world of online possibilities. All its plan comes with 45 days money-back guarantee. Don’t let anyone stop you from enjoying your streaming videos and music from anywhere in the world. Connect to CyberGhost VPN & Experience the Internet your way! Each plan includes: all the CyberGhost apps, dedicated customer support and access to the fastest VPN servers on 7 devices at the same time. Whatever plan you choose, you can enjoy all these powerful features including over 3800 Servers Worldwide, Ultra-fast streaming, apps for Windows, Mac, iOS, Android, No Logs Policy, Double Encryption, linking Up to 7 devices, 45 Days Risk Free and Live Support. CyberGhost VPN outclasses its competitor with a more generous money-back guarantee and higher value on long-term subscriptions. It even provides a handy ad blocking feature so you can experience the best of the web in peace. CyberGhost is offering a limited-time discount which you can save up to 75% on their 3-year subscription for only $2.75/month. No coupon code needed for this discount. Get started and try it risk-free now! When it comes to payment method, CyberGhost partners with different third party Internet sellers. So, in addition to credit card and debit card, the VPN also supports PayPal and Bitcoin which will make it attractive to a significant number of possible users concerned about privacy while paying. However, it doesn’t support international payment options like Alipay and union pay yet. Why Over 30 Million People Choose CyberGhost VPN? Using CyberGhost VPN will give you an additional layer of security in all aspects. As we know public Wi-Fi is almost everywhere, but using public Wi-Fi hotspots, such as in a coffee shop, airport or hotel lobby will be risky because these networks are often unsecured. Your connection could be hijacked or snooped upon. With CyberGhost VPN, you can keep all your data, video calls, search histories, and financial data private and stay safe on public networks always. Those interested in collecting data from public networks have no chance of accessing or abusively using your personal data or your data traffic. All your information is protected by the best-in-class, AES-256 encryption, making sure your devices are safe and secure. Online ads can be a big threat to both privacy and security. Ads not only interrupt your online browsing, but also affect your privacy because they function as tracking, collecting data about your browsing habits and preferences. CyberGhost VPN is able to block malicious website, malicious content and remove ads from web pages and apps. It even can remove website content that might be used to track your browsing behavior. Have you ever tried to access a certain website in another country and then received an error message stating that the website you are trying to access is blocked? Actually online censorship is implemented in various countries around the world, like China, Cuba, South Korean, Russia and more. In addition, many governments, companies, schools, and public access points use software to prevent Internet users from accessing certain websites and Internet services. So, to get a free Internet, CyberGhost VPN is a top option. It encrypts your Internet connection and allows you to change your IP address, which enables you to avoid any geographic blocks or restrictions being imposed. Thanks to VPN technology, you can get instant access to Google, Facebook, YouTube, Netflix, and all of your other favorite apps and content wherever you are. Users who share files and participate in torrenting often want to do so anonymously while ensuring their activity is encrypted and secured. CyberGhost VPN allows you to unblock torrent file sharing safely without putting you and your online privacy at risk. It protects your torrent traffic, enabling you to download and share torrents worldwide with other users and to access the content securely. Those who torrent files and use peer-to-peer file sharing services frequently are strongly recommended keeping their activity private with CyberGhost VPN. Everyone of us may probably go from screen to screen every day, using various devices. It is important to get a VPN that can support all the devices we own. Fortunately CyberGhost VPN supports all the major platforms including Windows, Mac, Android and iOS. And it offers browser extension for Chrome and Firefox, which allows people to easily switch server locations directly in browser and get more convenience. CyberGhost VPN also supports routers, Android TV, Amazon FireStick and more. With one single account, you can protect up to 7 devices at the same time. As the time of writing, CyberGhost VPN has over 3700 servers in 60 countries worldwide. CyberGhost keeps expanding server park and attempts at giving customers the best experience possible! CyberGhost scatters servers in Albania, Argentina, Austria, Australia, Belgium, Bulgaria, Brazil, Canada, Switzerland, Chile, Colombia, Costa Rica, Cyprus, Czech Republic, Germany, Denmark, Estonia, Spain, Finland, France, United Kingdom, Greece, Hong Kong, Croatia, Hungary, Ireland, Israel, India, Iceland, Italy, Japan, Kenya, South Korea, Lithuania, Luxembourg, Latvia, Moldova, Macedonia, Malaysia, Netherlands, Norway, New Zealand, Pakistan, Poland, Portugal, Romania, Serbia, Sweden, Singapore, Slovakia, Taiwan, Ukraine, United States, South Africa and more. The VPN comes with a “Best location” feature that will automatically connect you to the best server for you. Yes. CyberGhost VPN offers a very handy Kill Switch, which is a clever feature that most VPN providers have now implemented in their software. This feature protects your privacy in the event your VPN connection unexpectedly drops. The Kill Switch is automatically enabled in CyberGhost client, and you don’t have the choice to disable it. Streaming US Netflix is one of the main reasons why people turn to VPN services in the first place. As we know, Netflix offers different libraries of content for each geographical location. This literally means that you can’t access a show for US audiences if you live in China. CyberGhost is always one of the top VPN protection choices for unblocking streaming services like Netflix, Hulu, BBC, and other entertainment. It has good Netflix support. By using CyberGhost, accessing the Netflix is incredibly simple with the dedicated streaming servers. So, when connected to their Streaming-optimized US servers, you’ll be able to stream content from Netflix US with no buffering and no bandwidth limits. CyberGhost has a 45 days, no questions asked, refund policy for their 6 months or greater subscriptions. This ensures that no mistake purchases are made and aims to help with situations like customers not being able to use their services. NOTE: Monthly subscriptions have a 14 days money-back guarantee. CyberGhost VPN stands out from the competition for its powerful strong privacy features, large network and excellent speed. It covers over 3700 servers and uses OpenVPN tunneling protocol and AES 256-bit encryption to protect user’s data. It offers various features like hiding real IP address, access to Netflix, Kill-Switch, 7 simultaneous connections, and much more. CyberGhost VPN lets the users browse securely and anonymously. Bitcoin support and live chat are a plus for this VPN and make it worth the money. When you sign up for CyberGhost VPN service, you will have 45 days after sign up to terminate and get your money back if you choose plans longer than a year, and 14 days if you choose the monthly option, so you’ll have nothing to lose. Achieve the best online experience in safety with CyberGhost VPN now. 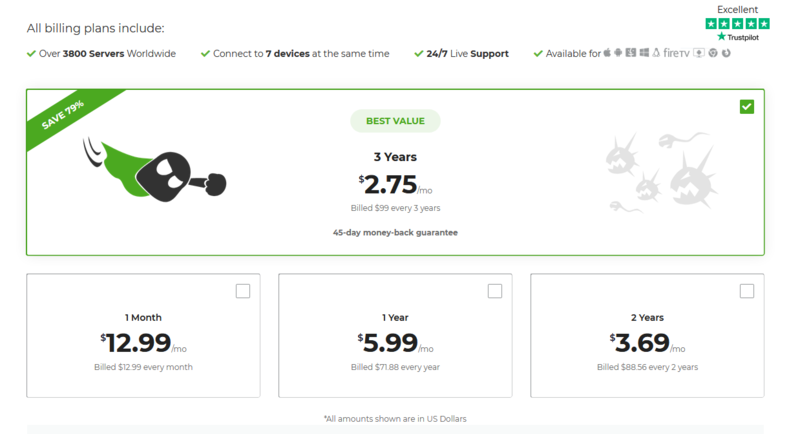 Get 3 year protection for only $2.75/mo. Limited-time offer. Hurry up!